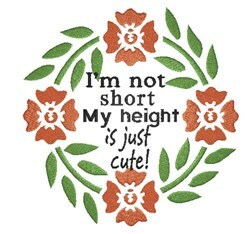 Share this funny design of a floral wreath with your vertically challenged friend by adding it to a blouse or scarf! King Graphics is happy to present Humorous Floral Wreath machine embroidery design which has 19774 stitches and is [145.29 mm x 147.32 mm] large. If you would like to view more embroidery patterns please search on our embroidery designs page.